How to obtain the Perfect Shave, the old fashion way, yet still very popular. Moisten the area to be shaved with warm to hot water. Dip the badger hair brush into hot water. Then dip the brush into your shaving cream or soap and swirl around to create the thick lather. Apply the lather to your skin in circular strokes. Leave on the face for 1 to 2 minutes. Rinse the brush with clean water. 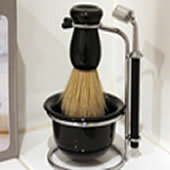 Shake excess water from brush and place in a holder with the bristles pointing downwards.